Cocktails, hors d’oeuvres, and the company of like-minded folks—it doesn’t get any better than that, which is why our 3rd Annual Oyster Social went off without a hitch! It was such a great event that it made the front page of the Star Democrat! 90 guests in attendance chatted and shared their experiences about oyster gardening while getting refreshments from the open bar and snacking on delicious appetizers such as Bacon-wrapped Shrimp, Oysters Florentine, and Spicy Crab and Artichoke dip. Scott Eglseder, founder of the Chesapeake Bay “Advance & Protect” Oyster Reef Recovery Initiative (ORRI), gave a fact-filled presentation on the inspiration for starting ORRI and the potential number of oysters we could grow if everyone with a dock started oyster gardening. Due to the effect of compounding, the result is in the hundreds of millions! He also gave a heartfelt THANK YOU to our growers and volunteers, without whom our organization wouldn’t be possible. Chris Judy gave an informative overview of the Marylanders Grow Oysters (MGO) program’s scope and the tributaries that are a part of it. He pointed out that each MGO cage costs the state around $20 and prisoners from the correctional institution in Hagerstown actually assemble them. The funding for the MGO program has been consistent and it has been conveyed that as the program grows, funding will still be available; good to know! Tommy Price from the ORP spoke about the Shell Recycling Alliance and informed guests that they can recycle used oyster shells at the Midshore I Homeowner Drop Off /Transfer Station in Easton on Barker Landing Road. 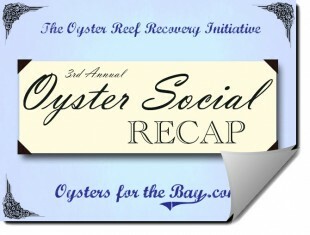 There is a tax credit available for each bushel of oysters recycled. Click here for a full list of recycling centers and visit the Shell Recyling Alliance webpage for FAQs and more information on tax benefits. Also in attendance was Kelley Cox, founder of Phillips Wharf Environmental Center (PWEC), Jeffrey Horstman, Deputy Director of Midshore Riverkeepers Conservancy, Elle O’Brian, Midshore Riverkeepers Outreach and Education Coordinator and Josh Bollinger from the Star Democrat. We were so glad to have our partner organizations, oyster growers, their guests, and potential growers at the event and we hope you all enjoyed yourselves as much as we did! To read our front page spotlight in the Star Democrat, click here. Below are some pictures of the event, courtesy of the Star Democrat.